Dougie Donnelly Television Sports Presenter & After Dinner Speaker is currently lead commentator on European Tour Productions worldwide live TV coverage of golf’s European Tour,travelling to around 20 tournaments a year around the world. He is also a a brilliant after-dinner speaker event & awards host. Dougie was one of the BBC’s top television sports presenters with many years experience of live broadcasting from the country’s major sporting occasions. He has been one of the most recognisable faces of BBC Sport since 1978, where football was his main responsibility. Network viewers will also know him well through his long time involvement with golf and snooker. He is a popular and humorous after-dinner speaker who has entertained a wide variety and mixture of audiences. Dougie Donnelly was born in Glasgow , where he began his career with Radio Clyde in the 1970s, presenting the top-rated Mid Morning Show from 1979 until 1992, and was twice voted Scottish Radio Personality of the Year. 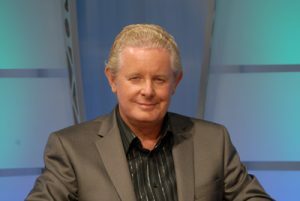 He joined BBC Scotland’s Sports Department in 1978, presenting programmes such as Sportscene Live , Afternoon Sportscene, the network’s Rugby Union coverage, and World Cups in 1990 and 1998. He presented two series of a TV chat show, Friday Night with Dougie Donnelly, and was TV Personality of the Year in Scotland in 1982. He left the BBC after the 2010 Scottish Cup Final, his 33rd in a row, and is currently lead commentator on European Tour Productions’ worldwide live TV coverage of the European Tour, travelling to around 20 tournaments a year around the world.